anything “chowder” is good eats. and is also made with a stick of butter, a cup of flour, and a vat of heavy cream. 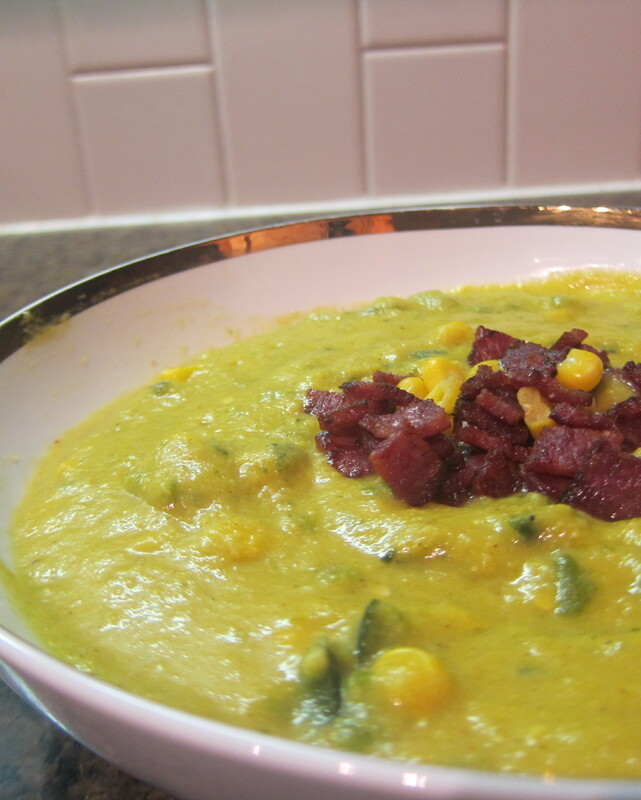 1 cup of this soup clocks in under 350 calories and with only 3g to 4g of fat. 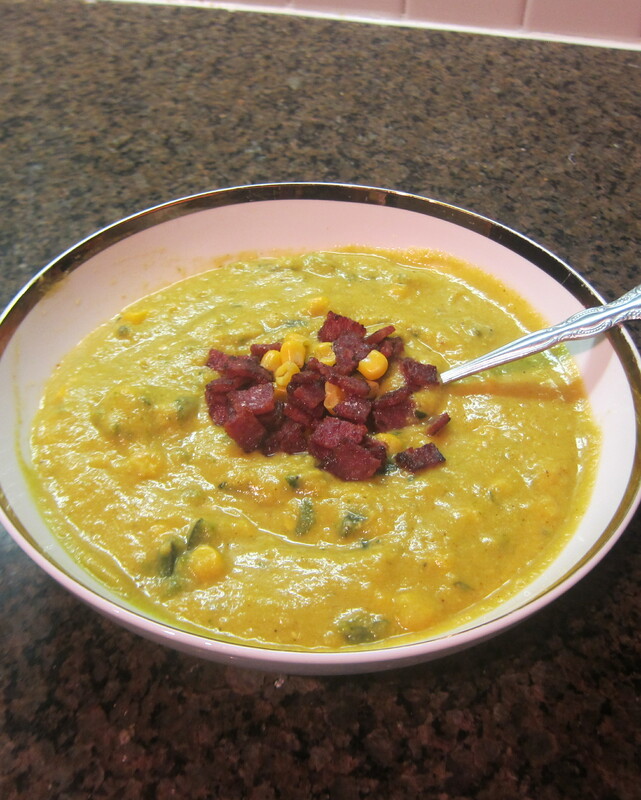 a note: my pictures look different than the process i am writing up because i used already made cauliflower soup when making this. cut the cauliflower into uniform pieces, lay in a single layer on a baking sheet, sprinkle salt and pepper. once the oven is heated, roast for 15-20 minutes or until golden brown. then crank the oven up to 500 degrees. move a rack to the highest level. place the poblanos on the rack and broil until the first side is almost black and blistered, rotate the peppers until all sides are dark and blistered. 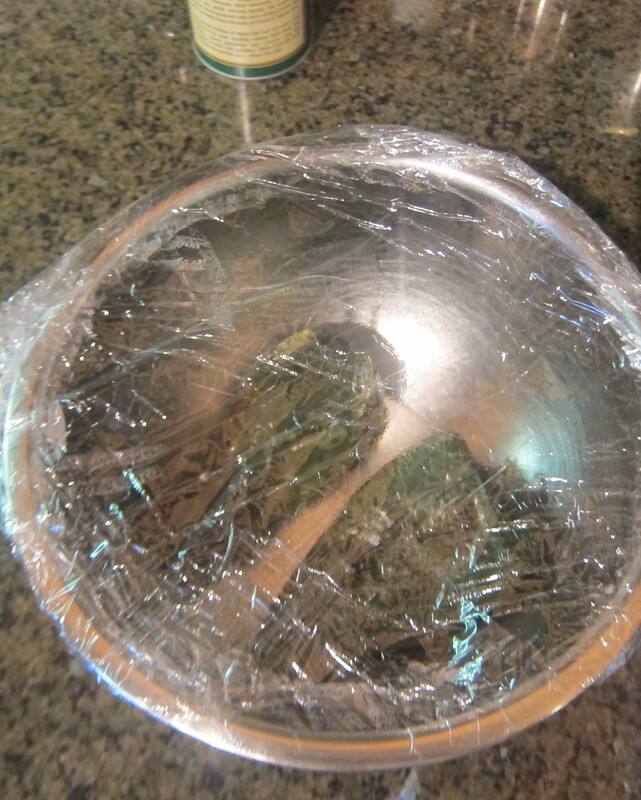 tranfer poblanos to a bowl and immediately cover with plastic wrap and set aside for 10 minutes. 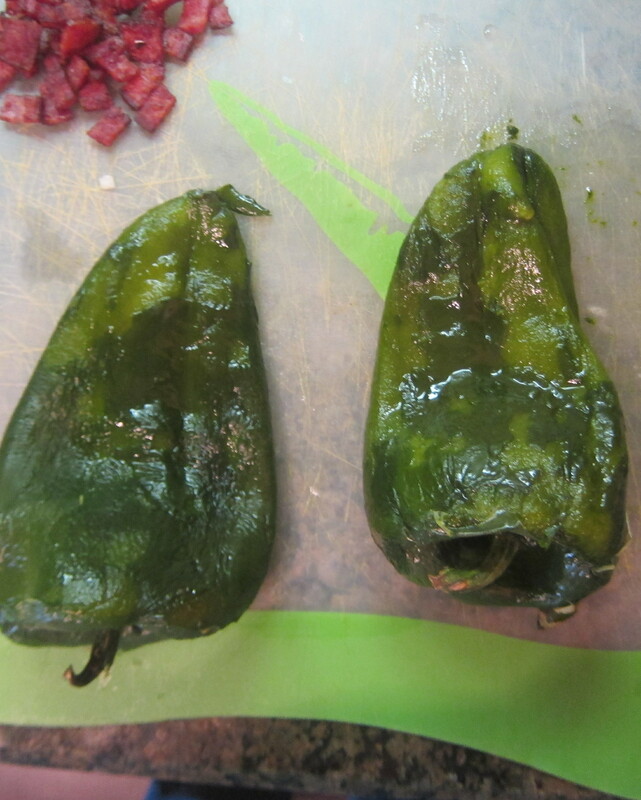 after sitting for ten minutes, easily remove the skin from the peppers by just peeling. 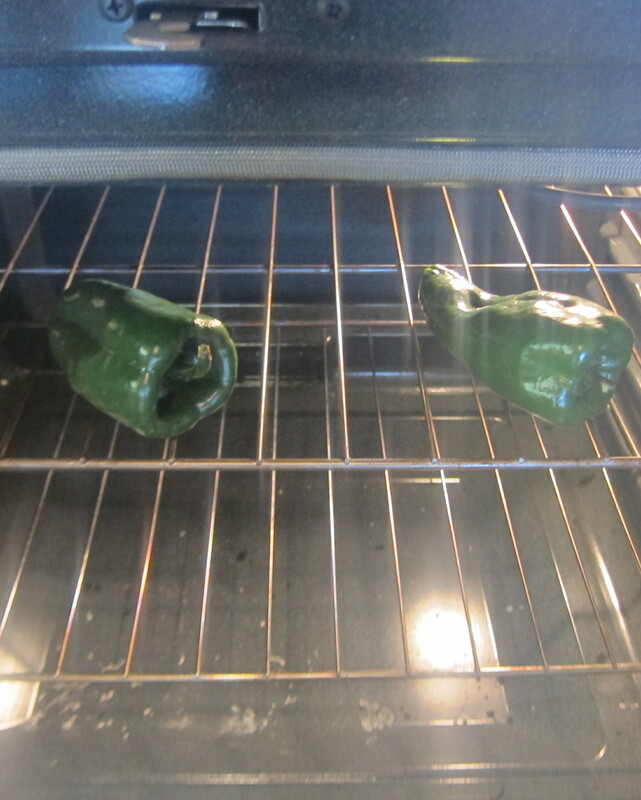 (letting the hot pepper sit in the covered bowl allows the steam to begin working the skins of for you). chop the peppers up into bite size pieces. heat a sauce pot over medium heat. 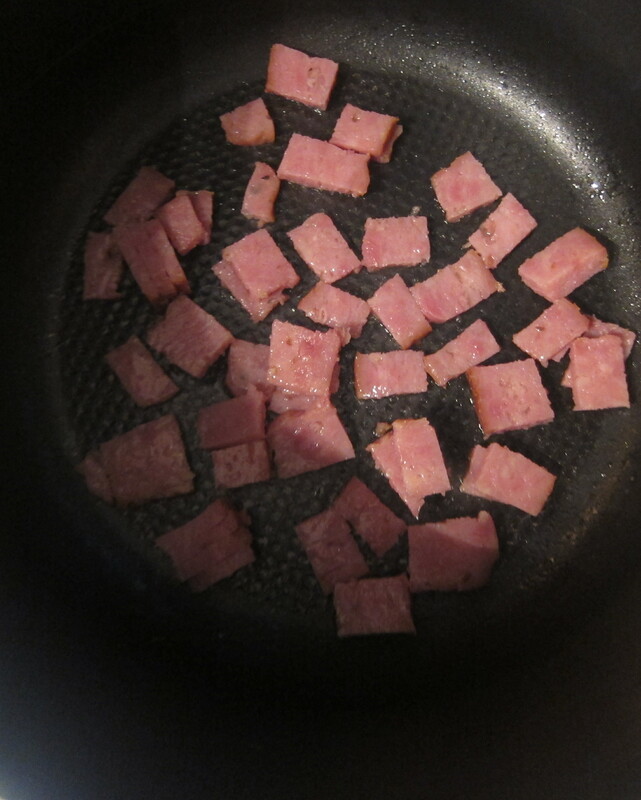 spray with pan spray and add the diced turkey bacon. cook until the bacon gets reaaaaaaallly crispy, about 7 minutes–move it around occasionally. the bacon will stick a teeny bit and leave a bit of fond on the bottom of the pan–this is GOOD, fond is our flavorful friend. once the turkey bacon is cooked super crispily, remove and set it aside. 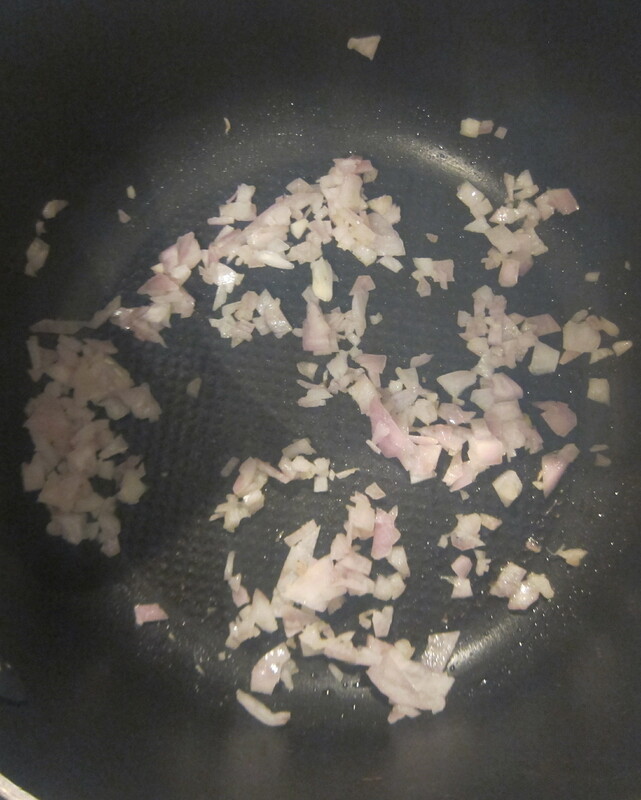 add the diced onion to the same pot, and cook until translucent but not brown. add in the garlic, let cook 2 minutes. 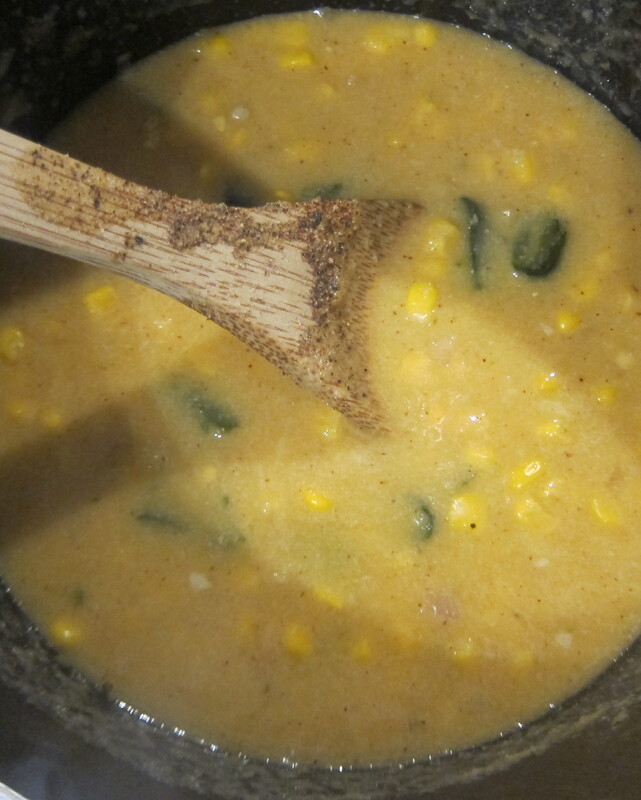 add in 1.5 c of the corn, a small handful of the diced poblanos, the cauliflower and all of the liquids. stir and bring up to a boil. 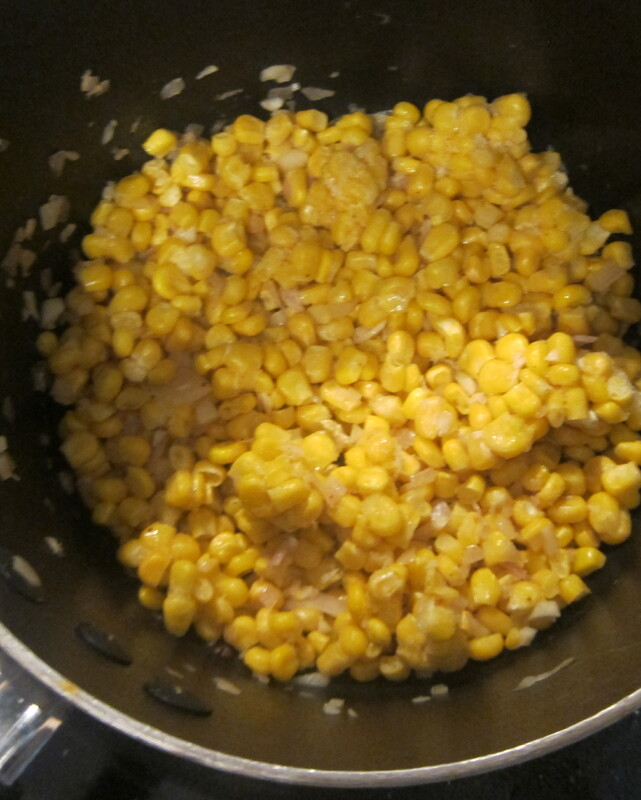 once boiling, reduce to a simmer and let simmer for about 10 minutes. 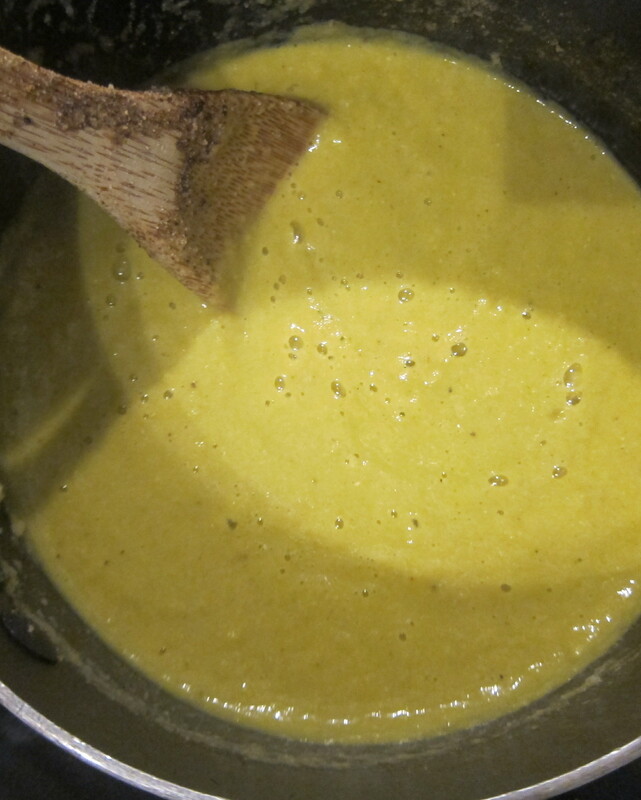 after simmering, pour the soup into a blender, in batches if needed, and liquify until smooth and creamy. 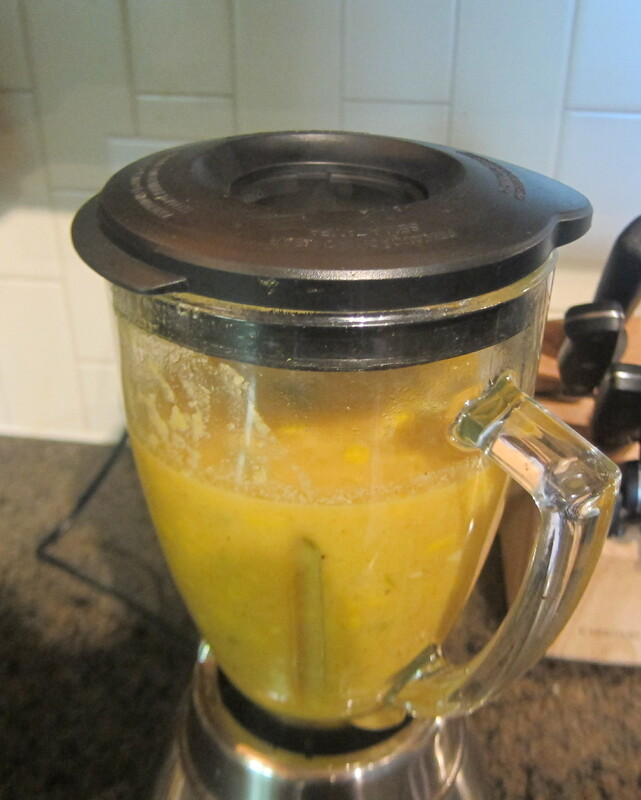 IMPORTANT NOTE: take the middle steam cap out of the blender so that the steam can escape while you liquify. otherwise the hot liquid will build up steam and may cause an overflow or movie like blender explosion mess. 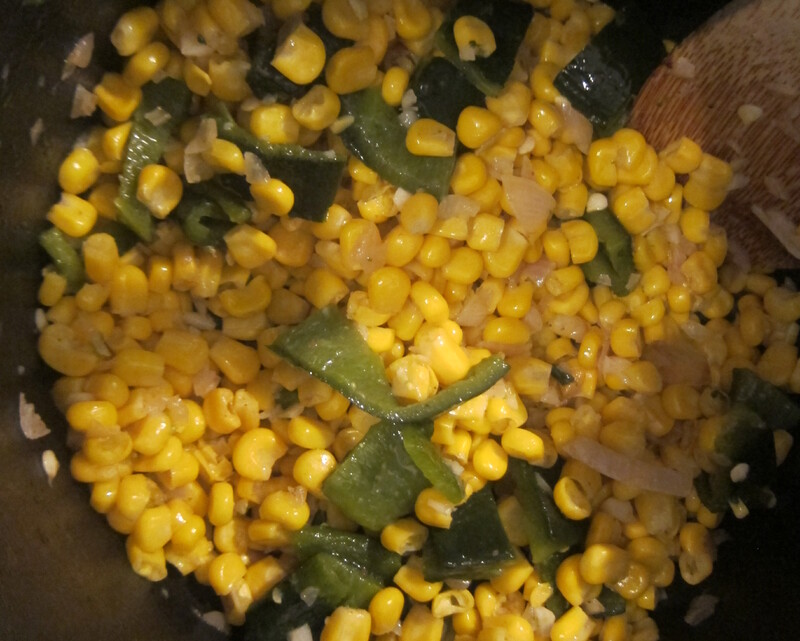 return the soup to the pot, stir in the remaining corn and poblanos. add a LARGE pinch of salt, a pinch of nutmeg, a pinch of chili powder, and some black pepper. taste and adjust the seasonings as necessary. 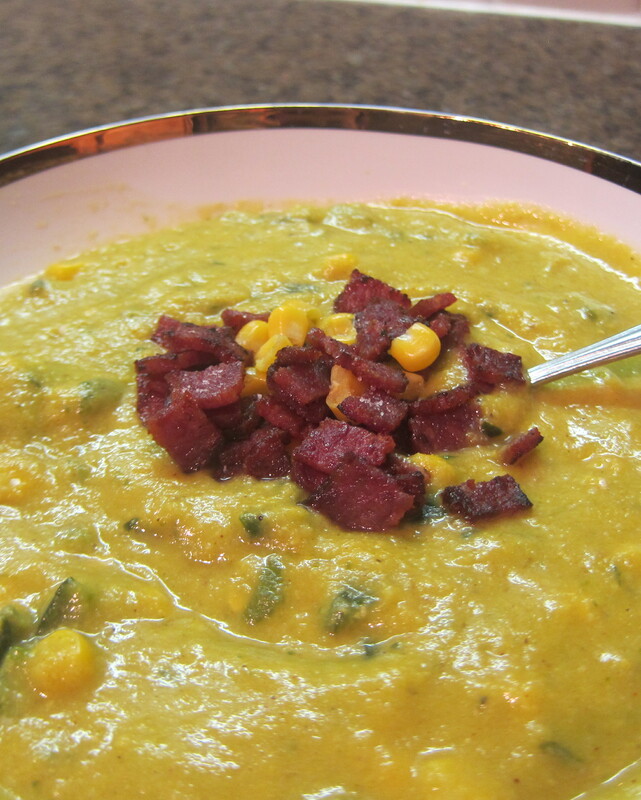 serve garnished with the turkey bacon! ENJOY! Made this and added some chicken for extra protein… its delicious and I didn’t miss the fatty cream at all!